The trivia teams prepare for battle. 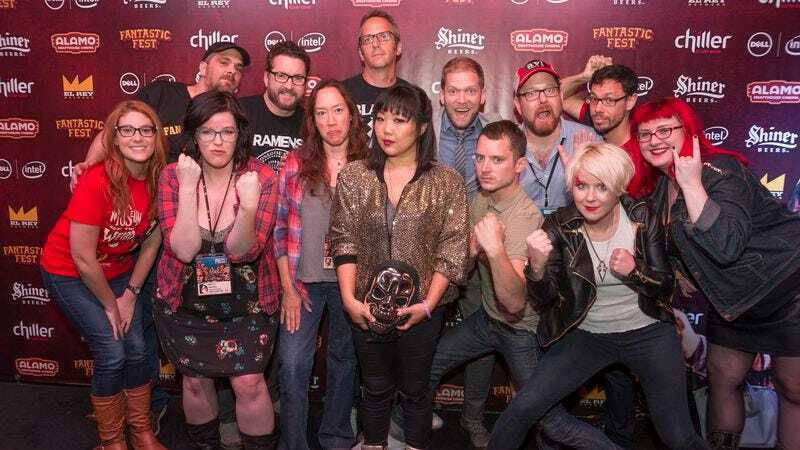 Photo: Fantastic Fest/Arnold Wells. But back to that morning: By the fifth day of intensive movie-going, fatigue starts to set in. Time is measured in screening slots as opposed to hours and minutes, and without diligent note-taking, the details of which movie had which Satanic goat in it become obscure. But I will have no problem remembering February (A-), which my colleague A.A. Dowd saw at TIFF and came recommended by other writers at Fantastic Fest. It’s remarkable that this is Osgood Perkins’ directorial debut, as his talent for creating mood—enhanced by the skittish, discordant soundtrack, clever structure, and skillfully affected performances—is what lifts the film above its familiar genre trappings. Beyond the unsettling atmospherics, I found February affecting on an emotional level as well, and will be evangelizing for it until it makes it out of the festival circuit and into theaters. The afternoon selection was Der Bunker (B), an agreeably twisted German comedy director Nikias Chryssos informed the audience will be distributed in the U.S. sometime next year by Artsploitation Films. The film seems to have sprung from one of the darker corners of Wes Anderson’s subconscious, using meticulously detailed, frequently symmetrical set design and mise-en-scéne to explore the kind of Freudian family dynamics usually discussed on the therapist’s couch. The story is simple, but with deeply weird details like an oozing sore on the family matriarch’s leg that dispenses advice on the education of her son, an 8-year-old boy with the face of an adult man. Unlike some comedies of this type, however, Der Bunker offers some actual laughs as well as quirk, and the guileless way it satirizes corporal punishment, home schooling, and child abuse invites further discussion. Lastly, before the feud some of my teammates and I caught a screening of Rabid Dogs (B-), a slick, surprisingly enjoyable French remake of Mario Bava’s 1974 poliziotteschi thriller. Unfolding over the course of one evening, Rabid Dogs follows a gang of amateurish bank robbers as they kidnap first a woman on her honeymoon and then a single dad and his daughter while fleeing the scene of a botched job. The daughter is in need of a kidney transplant and will die if she isn’t taken to a hospital in seven hours, a circumstance that gives extra urgency to the times that flash across the screen at regular intervals. This sense of urgency propels Rabid Dogs along nicely, maintaining suspense throughout as the criminals struggle to keep track of their hostages. It’s far from innovative both from a genre and filmmaking standpoint, and probably won’t have much staying power. But Rabid Dogs is an exciting ride, and that’s all you can ask for in a movie like this.